The Queen of the Classics is soon over us and every team who have a desire to make a difference have already been out on the cobbles to reconnoitre the pavé. They have been doing all they possibly can prior to the race to test different tires, shifters, frames and forks. The tech-factor is unmistakable high this year, and both Cyclingnews and Velonews have many good articles out with pictures, found respectively here and here. I'm not all that interested in tech myself. I'm on the level where I want my equipment to function properly, without ruining my experience on the road. My perspective is that I'm supposed to use it, not necessarily know all about it. What interest me though, is the difference in technological equipment teams utilise on the cobbles compared to other races. Cycling has really become a technological arena where everybody is trying to get the better of their opponents. Chapeau to those engineers from SRAM, Campa and Shimano, dodging all teams who want the best and be alone with it. How do they sort that out? Money talks and personal relations are key. Some time ago I interviewed Igor Turk, a Team Sky mechanic. 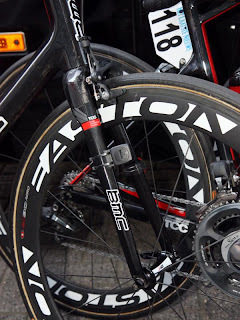 I focused on the tech-aspect as well and how they prepared the bikes for the cobbles. You can read the post here. Notice the longer blades on Hincapie's fork, making it difficult for mud and dust to gather. Dura-Ace Di2 shifters are placed on the drops, some have "thumb-shifters" on the top of the handlebars. 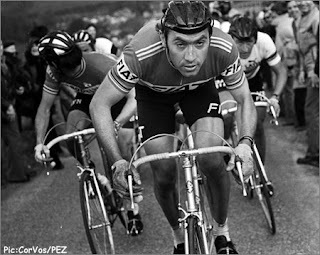 Picture downloaded at Pez cycling - here.